Select the Groups tab. Only available if groups (Azure AD or Google) are enabled. Check Show all to show all groups, including those that have not been added to a print queue. Depending on your organization, there may be a large number of groups, perhaps even 1000s. Uncheck Show all to show only groups that have been added to print queues. Select Search to search by group name. *If the group can not be found, then check Show all and select Resynchronize groups (dialog will close) and repeat the Search. Select the groups to select the groups to be added to the print queue. Check Exclusive access if you want to give the group members exclusive access to the print queue. Check Add print queue automatically if you the print queue to be added automatically to the computer, when a user in that group signs in. Select Back to go back to change the selection of groups. 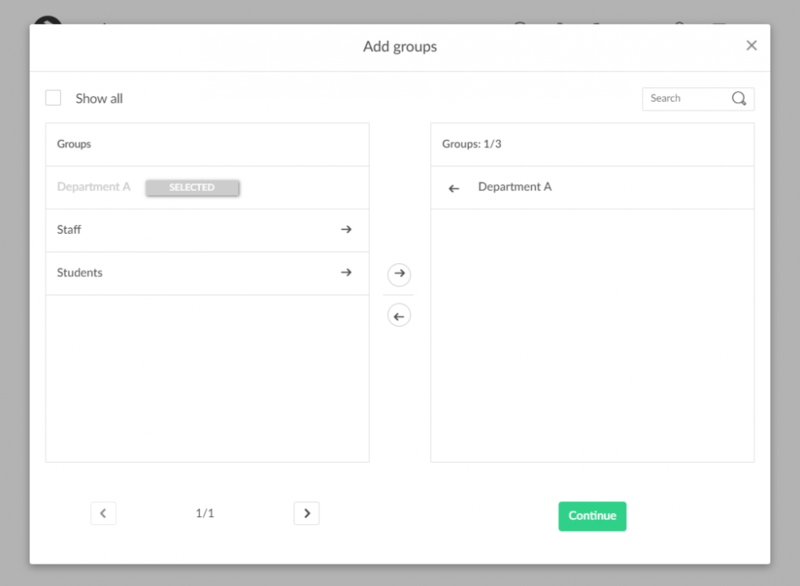 *If Exclusive access is checked for one group, then if you check Add print queue automatically for any other groups, those groups should also have Exclusive access checked.